Audio visual history is full of obsolete formats, and recent years have been particular harsh, with audio cassettes, DAT, VHS, S-VHS, betamax, videodiscs or Philips’s ill-fated DCC, to name but a handful, all biting the dust in a matter of years, while the CD is getting under constant attack from MP3 players and computers, and even the DVD seems doomed as hard-drive recorders become more common and broadband is more widely available and faster. Only the vinyl record has regained some market shares. One of these almost entirely extinct formats is Sony’s minidisc. Launched only fifteen years ago, it looked for a while as it was here to stay, but, with the arrival of the iPod and other MP3 players, the format rapidly became doomed. It was different when Gescom released Minidisc back in 1998. 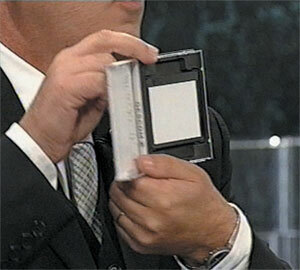 While albums had been issued on minidisc before, this was the first ever minidisc-only release. Composed especially to make use of some of the format’s specific characteristics, the album featured forty five tracks divided into eighty-eight segments destined to be played at random and looped at will, therefore creating an ever changing piece of work. With the demise of the format, OR and loose collective Gescom have decided to transfer the piece onto CD, described as the next best format available. Formed around the nucleus of Autechre’s Rob Brown and Sean Booth, Gescom has remained a mysterious formation, with very little information on the various contributors (allegedly up to twenty). Connections with the Autechre sound have perhaps become clearer in recent years, with Confield, Gantz Graf and Draft 7.30 especially displaying some of Gescom’s characteristics, yet the collective’s approach remains in most part more experimental. The very nature of this project, a radical digital cut and paste with open ends, makes it an intense experience. Sound particles of various sizes and consistence are slotted alongside each other without apparent logic into fragments of tracks ranging from just a few seconds to a couple of minutes. These are placed in such a way that it is very difficult to understand where a piece ends and another begins. Glitches, statics, samples, found sounds and noises cross the range at random, sometimes arranged into vague melodic or rhythmic formations, at others left to decay into silences, which in turn become sonic components. This vast collage however is much more coherent than could be expected. Either played in its original order or at random, MiniDisc is a fascinating piece with a surprisingly potent narrative, which, at times, evokes the work of the Radiophonic Workshop. Playing on the unpredictability of the medium, Gescom create here a truly magnificent, if somewhat difficult, piece which loses nothing of its substance on CD.